They dazzle me with the tonnage of cotton or cocoa that has been exported, the acreage that has been planted with olive trees or grapevines. I am talking about natural economies that have been disrupted — harmonious and viable economies adapted to the indigenous population — about food crops destroyed, malnutrition permanently introduced, agricultural development oriented solely toward the benefit of the metropolitan countries; about the looting of products, the looting of raw materials. In his Discourse on Colonialism, Aime Cesaire describes how colonialism facilitated the whole-scale destruction of entire societies whose peoples and cultures offered insights into how we may live peacefully alongside nature and create a new world. He revealed how colonialism’s fixation with what is produced, without regard to the process of production, obscured the poverty, malnutrition, displacement, and environmental destruction necessitated by an increase in the export of raw materials. Colonial endeavors far and wide were justified by their description as an effort to civilize barbaric natives, with the ultimate goal of replacing native models of agriculture, industry, and cuisine, among others, with preferred Western models, to facilitate the growth of markets for Western goods. To encourage this shift, traditional knowledge was cast as imprecise, deficient, and unreliable. These perceived gaps in indigenous knowledge could be solved by the adoption of scientific and western methods. The effect of this deification of scientific knowledge means that alternative models based in tradition and indigenous knowledge are not viewed as complementary practices, but as competition for existing scientific models. It behooves us to view science as one of several methods of discerning realities about nature and our relationship to each other. An uncritical adoption of scientific knowledge obscures how colonial and profit motives often impact the integrity of such discoveries, as demonstrated below. And when the primacy of scientific and western models results in the removal of communities’ control over their own land and food, it deprives them of self-determination and cultural vibrancy. To this end, scientists carefully counted and measured sample plots of trees, coming up with precise calculations of tree size and age under normal growth conditions. Scott reveals that state power utilized forest science and geometry to transform the living, diverse, old-growth woodlands into a new, more uniform forest. In pursuit of the ideal forest formed by scientific principles, underbrush was cleared, the number of species was reduced, and plantings were done in straight rows on large tracts. The archetypal German forest was seen as a victory of scientific control and management, and German forest science became the standard at the end of the 19th century. However, within a century of adoption of this new forest model, the negative biological and commercial consequences of this anesthetized woodland became clear. The second generation of conifers were retrograde in quality, creating a considerable loss in timber available for sale. 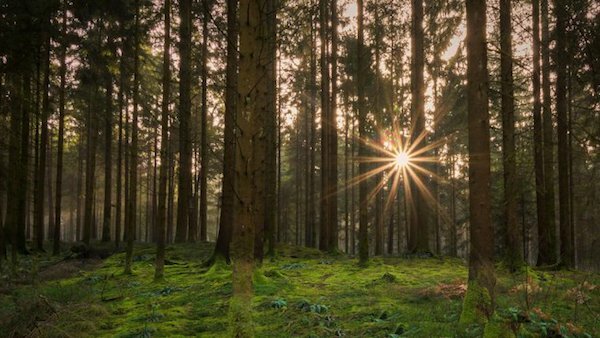 In examining the causes of this forest regression, it became clear that the first generation of trees had thrived off the incredibly nutrient-rich soil of the previous old-growth forest that it replaced. Once this soil was depleted, it resulted in a steep decline in growth rates. In the pursuit of an organized, manageable, and aesthetically pleasing forest, this German experiment disrupted a complex process of soil building, nutrient uptake, and an interdependent ecosystem of fungi, insects, mammals and flora. Can Pine Trees Survive in Palestine? Connected to this European forest legacy is the prevalence of pine trees in historic Palestine. In November 2016, 60,000 people had to evacuate their homes in the city of Haifa as forest fires threatened the city’s outskirts. A dozen smaller fires raged in forests throughout the country for over a week before Israeli firefighters were finally able to control them. Unsurprisingly, the Israeli government was quick to blame Palestinians, but a critical cause of these fires was the prevalence of pine trees in Israel’s forests, which are highly flammable, especially in Palestine’s very dry climate. The reason behind the existence of pine trees in Palestine is part and parcel of Israel’s settler-colonialist project. As is well-documented, around 800,000 Palestinians were ethnically cleansed from their homeland by Zionist paramilitary groups, and a majority of them before the official declaration of Israel’s independence (the Nakba) on May 15, 1948. Israel’s plan to ensure these Palestinian refugees could not return necessitated erasure of the violent process of ethnic cleansing that had birthed the state. So Israel undertook the minimizing of Palestinians’ historic presence, thereby demolishing the ruins of evicted and destroyed Palestinian villages in the 1950s. Part of this sinister project utilized the forces of the Jewish National Fund, which from the beginning of the 20th century had been collecting money to plant and maintain forests in Palestine. Pine trees were chosen to provide a visual representation of Israeli exceptionalism and have the land appear as an extension of Europe. Eager as the Israeli state was to erase Palestinians’ claims to the land, their haste to establish this through the construction of pine forests reveals the short-sightedness of the settler-colonial project. Palestinians, like other indigenous communities, know that their survival is intimately tied to the land and its fruits. Instead of approaching the terrain through the lens of control and subservience, there is an ethos of stewardship and an intimate knowledge of the land and seasons. In Palestine’s desert climate, its inhabitants sought to make the best use of rainfall to the region, whether through terracing of olive groves to protect against soil erosion and retain water, or through use of traditional methods to preserve soil moisture ahead of the summer growing season. The Israeli project in Palestine has been absolutely devastating to its indigenous inhabitants, who are additionally impacted by the demise of Palestine’s indigenous flora and fauna. As the pine tree example demonstrates, there is a clear desire to depict Israel’s ability to transform the existing desert landscape as a victory of science and European standards. This manifests itself in nearly every sector of Israeli society. Specifically in terms of agriculture, the Israeli mythology about making the desert bloom obscures the fact that the state monopolizes the use of water resources (including in its own settlements) to create an export market for its agricultural products in Europe. This market for Israeli produce is artificially sustained by depriving Palestinians of water resources. And what are the impacts of this artificially-sustained and resource-intensive Israeli agriculture? By creating a situation in which traditional Palestinian methods of sustainable agriculture cannot be followed, Israel continues to decimate ecological resources, from the soil to the water aquifers below ground. By enforcing “modern” methods of agriculture, there are few incentives for Palestinians to learn and preserve traditional agriculture, creating a dependency on chemical companies which supply seeds and fertilizers. As the Palestinian agronomist Saad Dagher observes, an effect of Israeli agriculture in Palestine has been a decrease in the number of farmers and a concurrent loss of indigenous farming practices. Palestinians are struggling to meet their own food needs, and agricultural biodiversity has significantly decreased—Dagher states that more than 98 to 99 percent of Palestine’s figs and almonds have disappeared. For those seeking answers to the question of how it is possible to materialize a post-capitalist, liberated society, part of this inquiry requires a willingness to scrutinize what is considered to be scientific “truth.” Another part of this inquiry will require respecting indigenous knowledge and practices, specifically those that highlight how people live in harmony with the land, and not in control over it. There is a tendency for scientific and modern practices to be marketed as the only “valid” form of knowledge. When these practices are used to support colonial and capitalistic ventures, the intention is to depict native practices as deficient, thereby setting the stage for wholesale adoption of the “ideal” methods. The error in forgetting or neglecting indigenous knowledge is that we will interpret our futures as completely delimited by capitalism’s demands. The reality is, capitalism and settler-colonialism cause a false crises of resources, rendering very few people (and flora and fauna) capable of survival. Indigenous approaches to agriculture are rooted in people living in harmony with the land and what it can offer, and exemplify more equitable and loving treatment of the earth and its inhabitants.